Youngstown Barrels and Drums Co. is a manufactures the best quality Ultra Spill Deck Bladder Systems. We make single Spill Deck (1, 2 or 4-drum) which are EPA and SPCC compliant. There is no need for it to be connected to other Spill Decks. The standard Spill Decks use bulkhead fittings to connect to other units for sharing containment. Ultra Spill Deck Bladder Systems are polyethylene containment decks. These Bladder Systems meet EPA and other spill containment regulations. They are available in 1, 2 and, 4-drum modules. 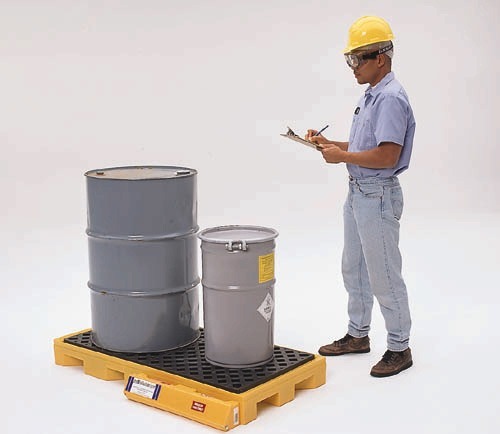 The low 5 3/4” deck height enables safe and convenient drum loading, without any help of drum handling equipment. An optional polyethylene loading ramp can be used for even greater handling ease. The Ultra Spill Deck Bladder Systems has a Compact footprint and saves floor space. These provide the perfect solution for waste collection usage. 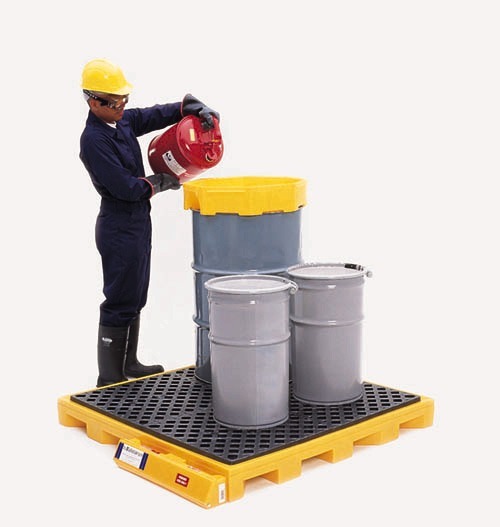 The Ultra Spill Deck Bladder Systems can be used in place of taller containment pallets. The low 5 3/4” deck height offers better safety and handling benefits. Small leaks and overspills are captured in the sump. View all our Environmental Containment Products. Can a bladder be reused? No, the bladders cannot be reused because spilled liquids might cause the internal surfaces of the bladder to adhere to each other. The proper deployment of a reused bladder cannot be guaranteed. How can the spillage be removed out of the sump/bladder? A pump can be used to remove any spilled contents from a sump or bladder. The Spill Deck Ramp has two steel clips which can be quickly installed at the end of the ramp. These clips hook onto the connecting Spill Deck. This prevents the ramp from moving while loading or unloading. What shall be done to add one Spill Deck to another? A Bulkhead Fitting and a T-Strip for every 26” of Spill Deck length that is connected are necessary. If you’re connecting a 4-Drum Spill Deck to another 4-Drum Spill Deck you will need two Bulkhead Fittings and two T-Strips. You will only need one Bulkhead Fitting and one T-Strip if you are connecting a 1-Drum Spill Deck to the short end of a 2-Drum Spill Deck. If the Spill Deck bought previously does not have any holes to put the Bulkhead Fitting through, can holes be drilled into it? Yes, a 1 9/16” or 1 ½” hole saw can work. There are “dimpled” areas on each side of the Ultra Spill Decks that indicate where holes are to be drilled. You need to be drill and carefully cut the hole(s) for your Bulkhead Fittings by centering the hole saw in the area. What are sidewall plugs used for? Sidewall Plugs are used if the Spill Deck is no longer connected and hence has a hole that needs to be plugged. Are these decks slip resistant? All grating surfaces on the Spill Decks are slip resistant. The T-Strips are laid across the points where two Spill Decks join. As the gap gets reduced, this piece diverts spills to either of the Decks and prevents any spillage from getting between the units. How many Bulkhead Fittings and T-strips are needed? You will need one Bulkhead Fitting and T-strip for each 26” of Spill Deck that is being connected. Assuming the Spill Decks are being used with 55-gallon drums, all of the Ultra Spill Deck Bladder Systems meet EPA requirements. The InLine Spill Deck Systems too meet EPA requirements. Though the 1-Drum, 2-Drum and 4-Drum Spill Decks do not meet EPA requirements, to increase the total sump capacity to 55 gallons minimum. they must be connected to an UltraTech bladder or another Ultra-Spill Deck. Ultra-Spill Deck Plus Models have gratings with the dimensions of 52″L x 26″W x 4″H. All other Spill Decks use a grating that is 48″L x 24″W x 2.5″H. How much space is necessary for the Bladder to completely unfurl? The Bladder rolls out 65.5″ away from the deck and becomes 66″ wide when it is completely unfurled. These Bladder Systems are available in 1, 2 and 4-drum modules. The low 5-3/4″ deck height helps in safe and convenient drum loading. So, there is no need of using a drum handling equipment. 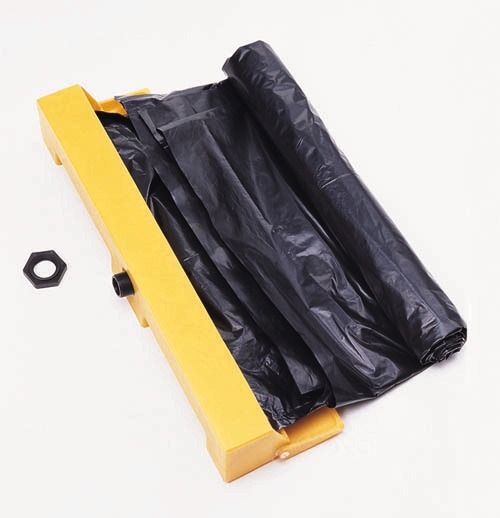 The optional polyethylene loading ramp can be added for even greater handling ease. With this model, small leaks and spills are captured in the 11-gallon sump. Large leaks flow into the bladder through a bulkhead fitting. This model is a low profile, single-drum containment unit that meets EPA Containment Storage Regulation 40 CFR 264.175. It is also compliant with uniform fire code spill containment regulations. It has a Compact design with dimensions as, 25-7/8″ x 30-1/2″ footprint. This saves valuable floor space. This model is perfect for single-drum waste collection usage. 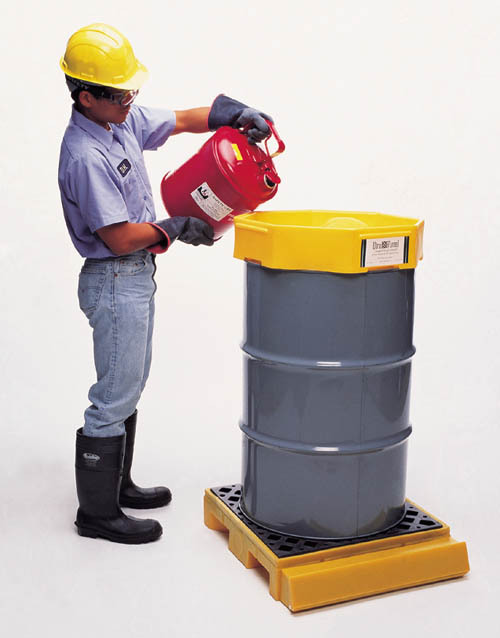 The low 5-3/4″ deck height allows safe and convenient drum loading, even without drum handling equipment. Add the optional polyethylene loading ramp for even greater handling ease. The model has a capacity of 77 gallons total containment. This model can be used to store 2 drums on the space-saving 25-7/8″ x 52″. The Spill Deck P2 bladder systems meet the EPA regulation and have uniform fire code spill containment regulations. It has a low 5-3/4″ deck height, same as wooden pallets. It allows drums to be “jockeyed” onto SpillDeck systems when standard drum handling equipment is not available. This model captures spills and small leaks up to 44-gallon sump. The application of these drums is satellite waste collection, drum dispensing, storage of virgin chemicals and hazardous wastes. A polyethylene bladder is housed inside the Bladder Attachment. You just need to connect the Bladder Attachment to the SpillDeck. No tools are required for this. Hidden containment bladder automatically unfurls to capture large spills or drum leaks. Optional bladder pump can be used to remove spilled material safely and efficiently. You simply need to feed the intake tube into the bladder through its bulkhead fitting and pump the spill into an empty drum. The spilled liquid can then be reused or recycled.